Through our house this summer we've had a pack of entertaining dog books. Maybe because we have our own naughty puppy these picture books have a certain appeal for us. First we read Be Gentle with the dog, dear! (2008)by Matthew J. Baek. This is a well-written story with very expressive illustrations and we love the shadow play which really demonstrates the toddler/dog conflict. My husband and I glanced at each other, with smiles playing across our faces as we read this book, remembering back to ahhh, yesterday as our six-year-old carried the cat, Pony around. She used to drag the puppy around when she(the dog) was much smaller. The puppy now weighs 41 hefty pounds (see photo above:) so it doesn't happen anymore. Of course, since we have two teenagers this scene has been played out many times over with other pets. 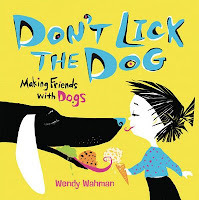 This is a great book to raise the issue to small children on how to treat a puppy or any pet really. The second dog related book we've read is Before you were mine (2007) by Maribeth Boelts, a local Cedar Valley author. Seriously this book made me tear-up!! It begins like this: " Before you were mine...Did you live in a warm house with warm smells, and a rug that was only yours?" The little boy character continues to have this conversation with the sweet yellow puppy throughout the rest of the book. We learn the puppy was abandoned somehow and at the shelter just waiting for this little boy! Wonderful example of how we can rescue a pet and give it a new home. The author's note at the back of the book says a portion of the book sales will be donated to the Humane Society-added bonus for buying this very special book. "So Bertie pretended he had a blue dog. He patted his pretend dog. He fed his pretend blue dog. He took his pretend blue dog for a walk. He threw a stick for his pretend blue dog." I like Polly Dunbar's art and this one has a nice surprise ending!! Woof! Woof! Check out her fabulously creative website! "Easy now, take it slow when meeting dogs that you don't know. Don't stick your nose in Stella's face-until you're friends, she needs her space." Each two- page spread has a suggestion for humans wanting to know more about dog etiquette. Love this one and so did J. and the husband as he took time to read it to our teenagers at the dinner table. Wendy has her own creative website here. How many of you have dogs out there or a favorite dog picture book?